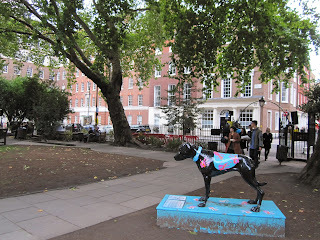 The square was developed in the late 17th century in the area known as Soho fields, in the parish of St Anne. The name Soho appears for the first time in about 1636 and appears to be derived from a hunting call, and the area had indeed been used as hunting grounds. It had in the previous century been known as St. Giles's Field, later Kemp's Field or Bunch's Close, and belonged in the middle ages to the custodian of the leper hospital of St. Giles in the Fields. It was seized by the crown during the dissolution and became part of the royal park of the palace of Whitehall. The land was granted on lease to the earl of St. Albans in the 1660’s and was further leased to Joseph Girle, who obtained a licence to build. The lease was nonetheless passed on to Richard Frith who started the actual building, along with his associate William Pym, from 1677 onwards. The square was known as Frith’s square in the early 1680’s, but was soon renamed King’s Square after a statue by Caius Gabriel Cibber of King Charles II was placed at the centre of the square in 1681. The rate books suggest that 14 houses had been completed and were occupied by 1683. This number rose to 23 by 1685 and to 41 by 1691. With the exception of Monmouth House on the south side of the square, all the houses followed an identical brick design: three stories high, with segmental pediments over the doorcases, horizontal bandcourses between the floors and presumably flat gauge arches over the windows. The windows were sash but some of the houses had mullioned-transomed windows in the top storey. The fronts were capped with a modillioned eaves-cornice of wood and the sloping roof had pedimented dormers. The land was granted as freehold in 1698 to the earl of Portland. However, the south side remained under the ownership of the crown and the last part of these properties was only sold in 1955. The Portland freehold was still subject to the lease agreement made to the earl of St. Albans, which only expired in 1734. The earls of Portland granted reversionary leases and a number of houses were rebuilt or improved after 1734. In 1790, the third duke began to sell the plots off as freeholds, and by 1805 only the garden square remained as Portland property. Three of the original houses in the northwest side of the square were demolished in 1735 and new ones subsequently built by the carpenter John Sanger. Two of these houses still stand: 38 Soho Square, at the corner of Carlisle Street, and 2 Soho Square. The building between them, 1 Soho Square, was demolished and a new building erected in 1904-05. The new building was designed by E. Keynes Purchase. Sanger's houses are both heavily altered. The shop front of number 38 belongs to the mid-19th century and the facade of 2 Soho Square is hidden under a coat of plaster. 3 Soho Square was built in 1903 to an art nouveau design by Charles H. Worley. The previous building was built for Edward le Neve in 1735 after the demolition of the original house. Numbers 4-6 was erected as one single building in 1801-04 for John Trotter, who used the building as a warehouse and later as the premises for the famous Soho bazaar. Trotter's bazaar was the first commercial building in the square but did not look out of place next to the other residential houses. The shop front was altered in the late 19th century. 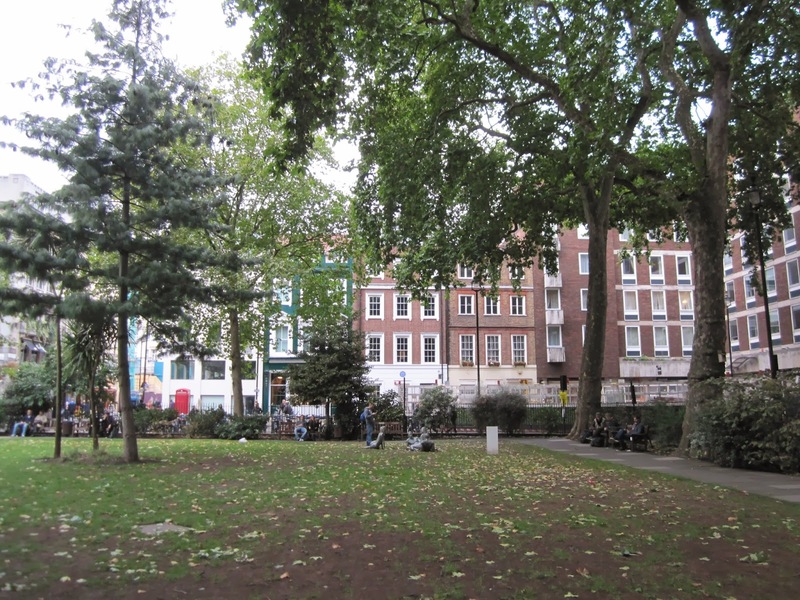 The original houses on 4-5 Soho Square had been demolished and replaced with new houses in 1726. The white building in the corner was built circa 1929, replacing a previous house from 1745-48. The previous house had a facade framed with a brick arch capped with a triangular pediment. The second storey windows were Venetian while the windows in the third storey were shaped as a lunette. The Venetian windows had balustraded aprons and ionic columns. The door case was flanked with doric columns and was capped with a triangular pediment. On both sides were flanking windows. The design is thought to be inspired by Robert Taylor. The house was used as residence for the Spanish ambassador and was later occupied by John Trotter. The original houses at 8-9 Soho Square were only demolished to make way for the new French Protestant church in 1891-93. The previous church for Huguenots was located in St. Martin's le Grand but was demolished in 1887 to make way for the extension of the General Post Office. The church was designed by Aston Webb, with a front in brick and terracotta. The stone tympanum of the central doorway was inserted in 1950. 10 Soho Square was originally built as two separate houses, which were united in 1696. The ground floor has been entirely modernised, and the upper stories have also been changed. Most notable is the addition of painted storey-bands and the window sills have also been lowered. Nonetheless, the house is one of the square's few survivors from the original construction. The building at the corner of Soho Street is from the early 20th century and replaced the original house there. 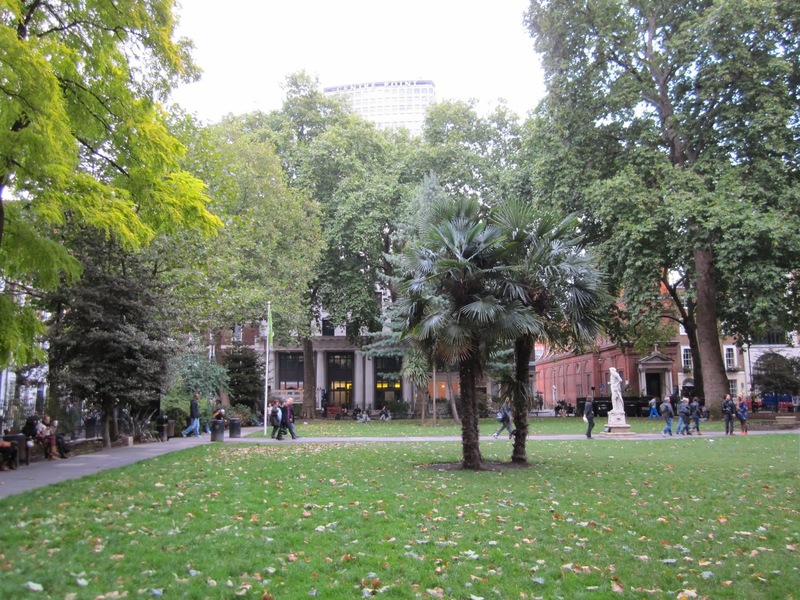 On the other side of Soho street, both 12-13 Soho Square were demolished and rebuilt in 1768-69 by Henry Homer. Both were given new street fronts in stucco sometime after 1857. 12 Soho Square still retains the look from the mid-19th century but the corner-building at number 12 has been demolished and replaced with a modern building. 14 Soho Square was probably rebuilt in 1796 but it's unlikely that the original building was entirely demolished. The front was remodelled in the early 20th century with a gabled top storey, but this has since been removed. 15 Soho Square is one of the few surviving houses in the square. The ground floor has since been stuccoed and the top storey is a later addition but the rest of the brick front may be mostly original. It is in yellow brick with red dressings, the windows have flat gauges arches and the floors are separated by moulded brick bands. The four plots 16-19 in the northeast corner have all been demolished and replaced with a new building, presumably sometime in the late 1960's. The previous building at 16 Soho Square was built in 1891 to a design by J. T. Wimperis and Arber. It was by built for Orme and Sons and included showrooms and workrooms with a billiard saloon in the basement. Orme and Sons manufactured billiard-tables. 17 Soho Square was possibly still the original house, though the front was quite altered: with a ground floor in rusticated stucco, wrought-iron balcony on the first floor and a parapet in front of the roof. The demolished house at 18 Soho Square on the east range seems to have been from the mid-19th century, while 19 Soho Square was rebuilt in 1883 by the architect Rowland Plumbe for Burroughs and Watts. It was a four storey red brick building. The present 20 Soho Square was built in 1924-26 by Ernest M. Joseph for Crosse and Blackwell. The original house was larger than most in the square and was probably started as two separate houses, subsequently united in the course of construction. Thos assumption is based on the irregular spacing of the windows. The house was seven bays wide and the roof had a balustrade. The house was rebuilt with a new design by Robert Adam on behalf of John Grant, who purchased the property in 1771. Adam rusticated the ground floor and added ionic pilasters to the first and second. He had originally intended corinthian pilasters and a doric porch was also omitted on grounds of economy. The first floor had iron balconies and the facade ws also topped with a frieze executed in the Adam manner and a tall balustrade. 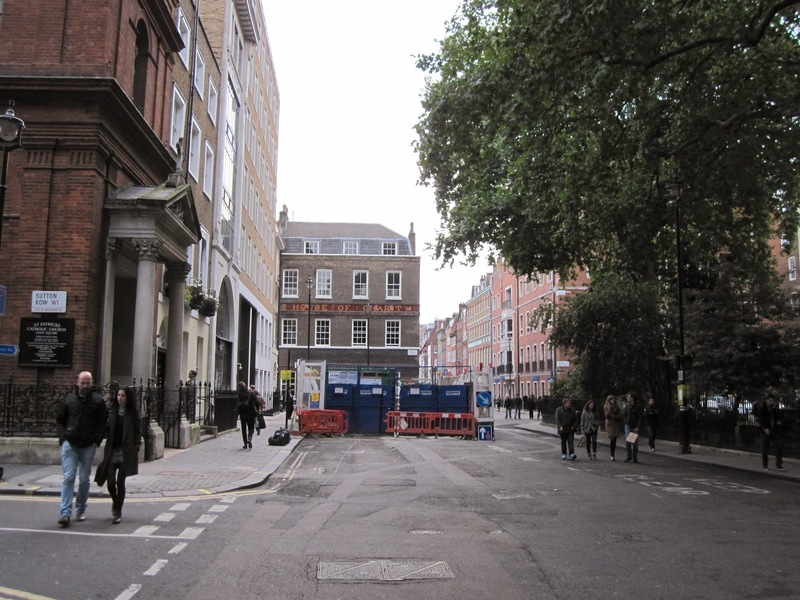 The site of 21 Soho Square was also one of two houses that had been united shortly after or during construction. It was briefly the Spanish embassy in the 1770's and was later used as a hotel, probably in reality a brothel. The house was altered or rebuilt for Crosse & Blackwell in 1838-40. The current shopfront is from 1927–28 and designed by M. W. Matts. The building on the south corner of Sutton Row is the St. Patrick's Roman Catholic Church and was built in 1891 by architect John Kelly. 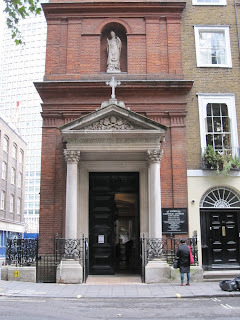 The premises had been used as a catholic chapel dedicated to St. Patrick since 1792. The upper floor of Teresa Cornelys' assembly rooms in Sutton Row was removed to create the chapel. Cornelys had been famous for balls, masquerades and operatic performances but was arrested for failing to honour her debts in 1772. The original house on the square, Carlisle House, was demolished in 1794 and replaced with two new houses. The southern of these still stands and is used as the presbytery to the church. The building adjoining the presbytery to the south was built in 1913–14 by the architects Taperell and Haase. The next building was erected in 1938–39 and was designed by Gordon Jeeves. It replaced three former houses. Both 23 and 24 Soho Square were rebuilt in 1734–5 by James Surman. Number 23 had a four-storey front with a bowed balcony on the first-floor middle window and a classical doorcase on the ground floor. Number 24 had a porch with doric columns and cast-iron balconies on the first floor, probably from the early nineteenth-century. 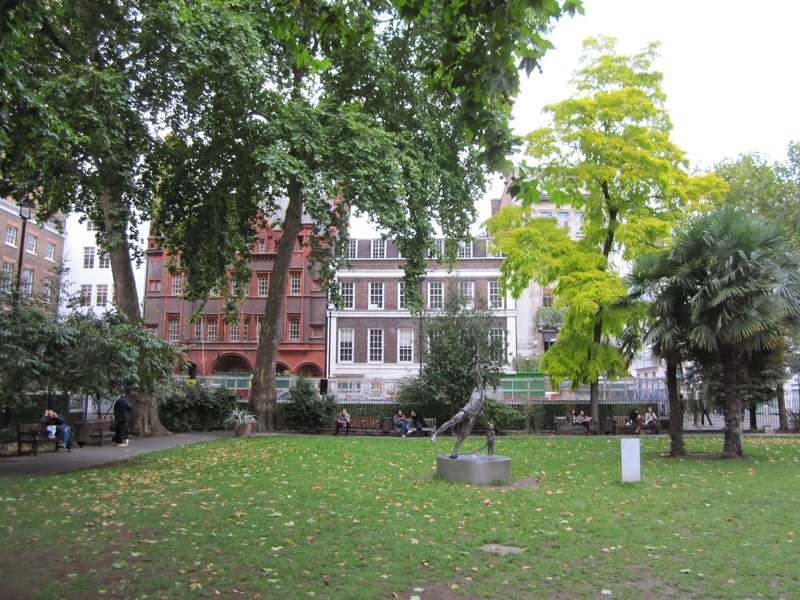 The original 25 Soho Square was demolished in 1758 and a new house was built for William Robinson. This was the 'Little House' of the two adjoining houses Robinson had built. The'Great House' to the south still stands, though the rusticated ground floor has been altered quite substantially. The two fronts were almost identical with Venetian windows on the first floor. 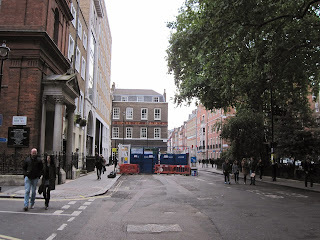 The front of 26 Soho Square is quite narrow but the site extends to the back of 1 Greek Street. The original house on the corner with Greek street was demolished in 1742 but the owner soon went bankrupt. The new house was subsequently built by bricklayer Joseph Pearce in 1744-46. It became the House of St. Barnabas-in-Soho in 1862, created for the relief of the destitute and homeless. A chapel was built and an inscription inserted into a bandcourse of glazed tiles. The inscription was once removed but has been re-introduced. The upper part of the walls also seems to have been partially rebuilt in yellow brick and the roof has been changed to a mansard. Otherwise, the house appears pretty much as Pearce built it. The building at 27 Soho Square, Nascreno House, was built in 1937-38 by architects Douglas and Wood, but the current neo-look is probably from a later date It occupies the site of the former houses 27-28 Soho Square. 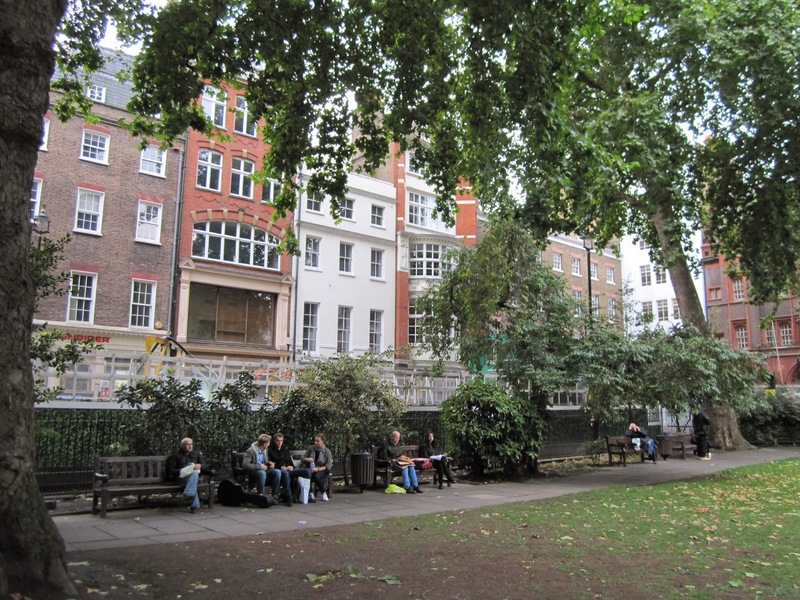 The original 27 Soho Square was subdivided into two separate houses around 1790 and was shortly after rebuilt by Richard Pace. The site of number 28 originally belonged to Monmouth House and was only built after the demolition of Monmouth in 1773. A new passageway was laid out through the cleared site, which today is called Bateman's Buildings. 28 Soho Square had a standard brick front with flat arches of gauged brickwork over the windows, a plain bandcourse at first-floor level, and a frieze under the cornice. 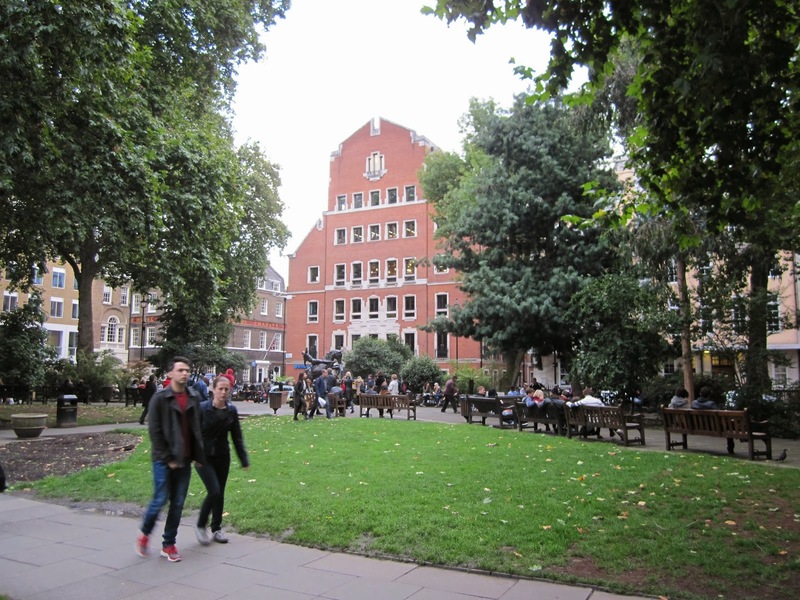 Both 28 and 29 Soho Square were completed in 1775 on opposite sides of the new passageway. The latter was demolished in 1867 and replaced with an extension for the neighbouring hospital for women. The hospital had occupied the adjoining house of 30 Soho Square since 1851. The original house had been partially rebuilt in 1730 and the two houses were given a common facade in stucco in 1909-10. 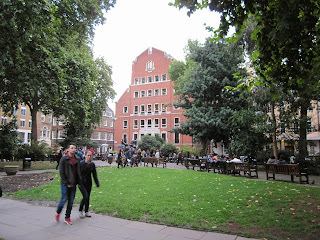 The house that originally dominated the south side of Soho Square was Monmouth House and this was also the only house from the beginning to deviate in style from the other houses in the square. It was incomplete when the duke of Monmouth was executed in 1685 and would only be finished by William Batesman in 1719. In the intervening years, Huguenots used it as a chapel and it was also considered as the site for a new church. The facade built for Batesman is usually attributed to Thomas Archer. The front had end bays with corinthian pilasters placed below the ends of a giant broken pediment. These were linked by balustrades to the much smaller central pediment. The porch had corinthian columns and a balustraded balcony. The south west corner of the square is dominated by 20th century buildings in a mock-Georgian style. 31-32 Soho Square was built in 1936-37 by architect Gordon Jeeves for Twentieth Century Fox. The previous buildings on the plot had both been rebuilt in the 1770s. 31 Soho Square was a large mansion with a brick front including a rusticated ground ground floor and a porch of ionic columns, both presumably added in the late 18th century. 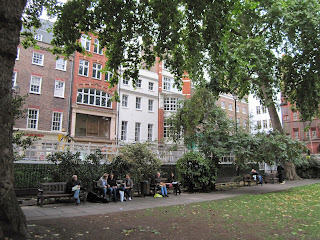 32 Soho Square was rebuilt in 1773-1775 and may have been the work of Robert Taylor. The front had a Venetian window motif in the third floor. The entrance was flanked with columns and sash windows under an semi-elliptical arch. The windows above were separated by ionic colunms while the Venetian windows had composite. 33-34 Soho Square were both demolished in 1950 and replaced with Parkwood House, designed by Leslie Norton. The same architect built the adjoining building at 35 Soho Square in 1955-56 on very similar lines. 36 Soho Square still stands though it was refaced in the late 18th century. 37 Soho Square, at the corner with Carlisle Street, was rebuilt in 1766 and the shop front is from the 19th century.